Meghan Markle has the entire world waiting in anticipation for the news she has given birth to the royal baby. Although the former Suits actress and Prince Harry will not be following in Kate Middleton or the late Princess Diana’s footsteps by posing for pictures with their newborn outside the Lindo Wing, and will keep the arrival of their little one a secret, the couple’s close friends and family have been dropping A LOT of hints on when we can expect the new addition to the Sussex family. Serena Williams has apparently recently let slip the gender of the Duchess of Sussex’s baby, and Prince Charles has hinted to when Meghan will go into labour. Now, Meghan’s make-up artist, Daniel Martin, who perfected her beauty look on her wedding, has shed some light on when we can expect the little one. The New Yorker has hinted the royal baby will be here before May 5, within the next TWO weeks, because he will be gracing the stage at The Make-Up Show on that day. On a recent Instagram post, he wrote: ‘I’m very excited to share that I’ll be making my first ever main stage appearance @themakeupshow on Sunday, May 5th from 10am-11:30am. 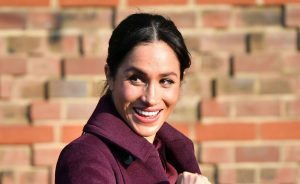 The post Meghan Markle’s make-up artist just dropped a major hint about her due date appeared first on Marie Claire.